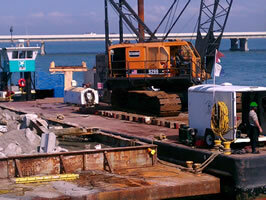 DTI has maintained a competitive position in the marine services industry since the companies formation in 1980. DTI was originally founded to provide high quality underwater inspections, but quickly expanded to accommodate its growing customer base. In the mid 1990’s, DTI had begun to specialize in the maintenance of water based utilities. DTI has since grown into a full service commercial diving contractor with experience in a wide range of diving applications from the simplest inspections to the most complex construction projects. DTI has extensive experience in marine consturction: from installing pipelines, cables, and various types of scour protection to working on large marine construction projects, including bridge construction, pile jacketing, and epoxy injection. Engineering firms, for some of the largest marine construction projects in the state of Florida, utilize DTI's underwater structural inspection services. Numerous power plants, port authorities, municipalities, and county governments obtain underwater structural inspections of all types from DTI. DTI specializes in the maintenance of power plant and phosphate mine facilities. Activities in this area include cleaning trash racks and traveling water screens, debris and sediment removal, burning, welding, and non-destructive testing. Additionally, DTI is one of only a handful of companies capable of supporting nuclear diving operations. We have worked on projects involving repairs and modifications to fuel handling systems, up enders, spent fuel pool liners, and fuel handling cranes. DTI supports research diving for NOAA, and other oceanographic engineering firms, and government agencies. Our company has been contracted on many research projects, including the deploying, the maintaining and the retrieving of the instruments used to measure currents, wind speed, and water temperature in the Gulf of Mexico and in Tampa Bay (Physical Oceanographic Real Time Survey). Some of our specialized equipment and systems include: NDT ultrasonic thickness testing equipment, digital depth monitors, electronic metal detection, underwater high resolution video with surface monitoring and audio, underwater 35mm photography, air lift systems, hydraulic submersible pump systems, electromagnetic cable detection equipment, differential GPS system, underwater burning and welding equipment, remotely operated vehicles (R.O.V.’s), and various underwater hydraulic tools. With a dedication to safety and a reputation for quality, Dive-Tech International, Inc. has become the largest diving contractor on the west coast of Florida, currently servicing, but not limited to, the Southeastern United States and the Caribbean. Dive-Tech International, Inc. is a full service commercial diving company, a Certified Small Business Enterprise, (SBE), as well as a member of the Association of Diving Contractors, (ADC), and ISNetworld, (ISN). Additionally, we are fully insured and comply with 29 CFR 1910 Subpart T (O.S.H.A. ), 46 CFR 197 Subpart B (U.S.C.G.) as well as DTI's own Safe Practices Manual. Copyright © 2018 Dive-Tech International Inc.